The TV fireplace set is very attractive in interior design. But how should a television be installed beside or above a fireplace or ethanol burner? Flat-screen televisions and ventless ethanol fireplaces have truly facilitated the installation of a cozy and balanced fireplace in living rooms and indoor spaces. At the Forefront of Fashion! TV fireplace set is the key and essential element of any living space. In modern living rooms, these devices are becoming increasingly harmonious and discreet. They have become more integrated into the style of the room. The television and the ethanol fireplace are no longer enormous devices that occupy the entire space, but rather objects that combine a simple installation and high-level technology. This is a radical change that allows the TV fireplace set to be used daily. Unlike in the past, the television and the fireplace can both be started with the simple press of a button. The widescreen television and long ethanol burner set is very trendy in modern design. This is due not only to a variety of factors operating in home fashion, but also to the new capabilities of these devices. The first reason is ergonomic. The TV fireplace set has become adapted to our field of vision, which is wider than it is high. We feel more comfortable with devices that have espoused the perception of our senses. A large screen and a long ethanol burner allow us to naturally maximize our enjoyment. The second has to do with the new design possibilities made available to interior designers and decorators. There is no longer the question of a massive TV with a vented fireplace that take up all of the available space. The fireplace and the flat screen easily integrate into any style of decoration and design. The third reason is due to the simplicity of installation and use of the TV and embedded insert set. 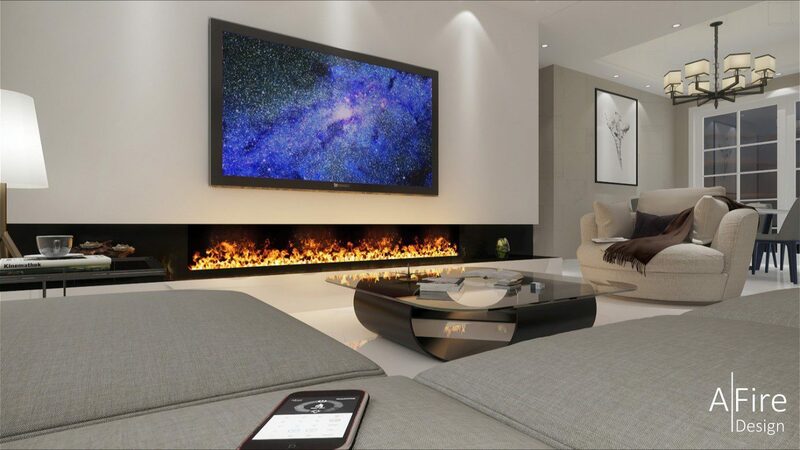 As vents are no longer necessary, the television – ethanol burner or water vapor fireplace insert set can easily be installed without major work. Moreover, these devices do not require maintenance. They can also be used daily with the simple press of a button (remote control, button on the device, home automation, smartphone, etc.). Most of the time, having the fire line under the television is the preferred design. However, some designers prefer installing the fireplace next to the flat screen. The television fireplace set is designed with the simple idea that the heat emanating from the fire area should not damage the electronic devices. If the television and fireplace are placed side by side, there is no issue, since heat rises (if you leave a few dozen centimeters between them – 10 or 20 inches). However, if the flat screen TV is installed above the ethanol burner, it becomes necessary to either divert the heat with a leveling difference (in front or in the back), or to create a recess for the TV. We should add that, with an ethanol burner, the height of the installation of the screen is not a problem. There is no need to twist your neck to watch TV when it is set 70 to 80 cm (25 to 35 inches) from the ground. Regarding the television and 3D water vapor electric fireplace insert set, there is no heat therefore no installation problem. When installing a television fireplace set, using the services of a designer or interior decorator is not superfluous, but rather ensures both ingenious results and the proper progress of the work. These creators rethink and optimize interior space, make it safe, and adapt it to the needs of those who live there. They have a real knowledge of the market, the trends and the materials to be used. Depending on your budget and your desires, they adapt both television and fireplace to your living environment. Why not call upon building professionals to ensure a successful installation? Which device to choose to install a fireplace TV set?